One reason for me getting back smartly from the Ryder Cup was Sharon's 40th birthday party on the Saturday night. A good thing about flying in from Bristol was that it meant I was able to meet Michael coming off the plane from Dublin to surprise Sharon (although she didn't seem overly surprised to see him). Sharon had a fairly small party for friends and colleagues in Gillespies cafe at Buckstone in the evening, to save us having to prepare food and get the house in order. It had a pleasant ambience and we had a relaxed evening as the wine flowed. No big speeches or birthday cake, just a low-key acknowledgement that my wife has now joined me in the forties! I persevered in watching the Ryder Cup on TV, although it was subject to further rain interruptions. Europe lost the first two rearranged sessions to finish 6-4 down before storming back on the Sunday afternoon, the Americans only winning half a point out of the six on offer. I somehow managed to avoid hearing the score on the Monday, the extra day required because of all the time lost, and was able to sit down in the evening to watch the nail-biting climax that I'd recorded. It wasn't quite as exciting as watching it live because I had a sense that Europe had won, given they had started with a three point lead, but coming down to the last match, for McDowall to roll in the birdie putt on 16 (right below where I would have been watching on Friday - I noticed the hospitality was all closed on the extra day) and then Mahan to make a mess of 17, it was certainly closer than I had anticipated as Europe clinched it 14.5-13.5. Well skippered Monty! Sharon's actual birthday began with the boys singing "Happy Birthday" to her. Well, Angus just stood around and tried to figure out what was going on, but he was there. Sharon had lunch with Wendy, did some light shopping, met me for an unsuccessful selection of her birthday present (I subsequently bought her a pair of sparkly earrings) and then cooked her own birthday champagne dinner for us both. 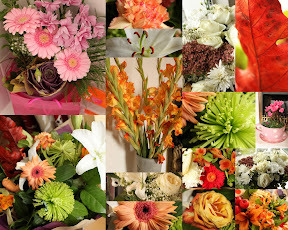 There were more flowers in the house than I can ever remember (nine bouquets were counted at one point). The kitchen resembled a florists! The final act of the week was a meal at Leven's Thai fusion restaurant near the Kings Theatre in the former Favorit premises. It was excellently presented and tasted good too, although the fusion element does have the potential to miss the mark. From there we went to the Guildford to meet Alana who was up with her mum Lily for Lily's 65th birthday. It was good to see Alana for the first time in a couple of years, as feisty and bubbly as ever! At this point, Sharon received word that she was an auntie! Edel, who was about ten days overdue, gave birth to a bouncing baby boy, Barry Matthew O'Sullivan, 10lb 6oz, around 7pm on Saturday 9th October. Just missed out on that 10/10/10 birthdate!